I'm a man of my word. I love hard and tell it like it is. But the Mafia has me in their crosshairs and I'm in deep. Partnering with a crime boss is one thing. Working for a crime boss who is also your father-in-law…that's just f***ed. This is the continuation...and it is just as gritty as the first one. The first time I read one of Scott Hildreth's books, I was...shocked isn't the right word, but there was something about it that made it seem more real. 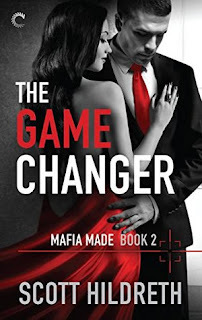 This is great when we are speaking of the romance and the characters (who were very real in this one) but is a little tough (at least for me) when it comes to the violence of the mafia life. But, then I think about what I said. Hmmm...this author portrays mafia life/violence in a way that feels authentic. Actually, this is a good thing. I have zero experience in anything related to the mafia...unless you count movies and tv shows, so the idea that this can shock me, and unsettle me, and give me pause...I liked that. I liked it a lot. I also liked Terra and Michael. I liked the realism, I liked the fact that they both seemed fairly committed to the idea that they were together. This worked for me and, again, gave this a realistic quality that made me want to keep reading even after the "book complete" appeared on my Kindle. Oh, and the events at the end, those made me want to keep reading too.